Considering a Housing Extension or Alteration? Whether you are a property investor or an individual looking to alter an exisitng building or thinking about a housing extension, Millers Builders can meet your alteration requirements no matter what scale the project is. We have many years experience in housing extensions and making building alterations so you can be confident in getting the result you want. Through careful planning and working closely with you we will guide you every step of the way. We will work closely with you and ensure you are informed at every stage of process to ensure the end results meets your expectations. 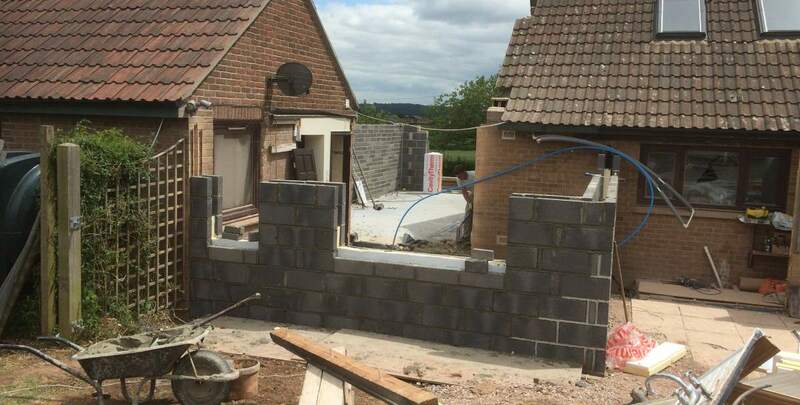 We have carried out a range of small and large housing extensions in Taunton, Somerset and across the South West over the last 25 years so you can be confident with our work. We only use the best products when making housing alterations and extensions so you can be confident that the results will be as expected. Our accreditation with the NHBC provides an insurance backed guarantee. Our remit here was to provide a more substantial link between the main house and the joining annex. The link between the two buildings evolved from an unsatisfactory link of doorways and a substandard conservatory. The new works not only addressed this but also provided a large utility area, open planned kitchen area with a substantial dining area linked to the existing front room. The installation of bi-fold patio doors to the front elevations allowed the construction of a large raised terraced area surrounding the extension protected by a glass balustrade system. In this project we removed an existing fireplace and replaced it with a log burner and adapted a modified the surround to meet the customers specification.